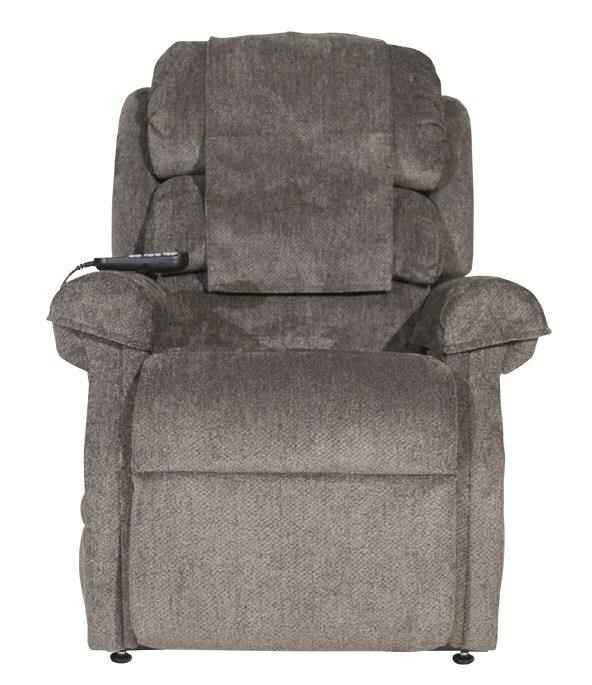 With its three-pillow waterfall back and rolled arms, this lift recliner mixes tailored elements with casual comfort. The recliner is remote operated with independently operating backrest and footrest, allowing you to create positions that place the feet above the heart to reduce lower back pressure. An extra pocket is perfect for storing magazines or the remote, bringing smart function to this comfortable classic. The Stellar Comfort Lift Recliner by UltraComfort at HomeWorld Furniture in the Hawaii, Oahu, Hilo, Kona, Maui area. Product availability may vary. Contact us for the most current availability on this product. Seat Size: petite. For people 5'2" and under. Recliner Mechanism Exclusive AutoDrive remote hand control; includes battery backup system using two 9 volt batteries (not included). Frame Construction Frames composed of northern maple hardwood, poplar, and engineered furniture laminate products. Warranty 1 year warranty on fabric, foam, pocketed coils, and electrical labor; 3 year warranty on electrical parts and mechanical labor. Browse other items in the Stellar Comfort collection from HomeWorld Furniture in the Hawaii, Oahu, Hilo, Kona, Maui area.